Among the high school set, thrifting has become a very popular way of restocking a closet for the next season. There are several thrift, re-sale and vintage stores in the area that cater particularly to teens and young adults. They offer quality, on-trend clothing at greatly reduced prices. These stores are good for the environment as well because they recycle clothing that might otherwise just get discarded. Kids can also resell their gently used clothes on consignment to make some extra cash to…well…buy more clothes. 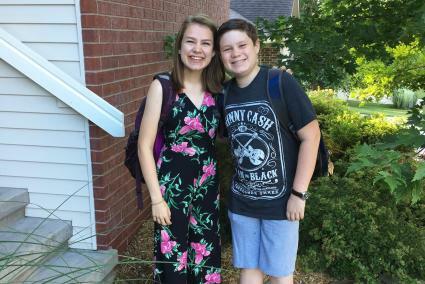 Some of my 17-year-old daughter’s favorite places are Plato’s Closet in Coralville, and Ragstock and White Rabbit in downtown Iowa City for their fun selection and amazing prices. My 14-year-old son’s tastes are more streamlined. He gravitates toward graphic t-shirts and will wear athletic shorts until the snow starts flying. For him, the Coral Ridge Mall is the venue of choice because it houses a wide range of national retailers under one roof, so he is guaranteed to find what he likes. Old Navy, Target and Scheels are always safe bets for getting him outfitted for the new year. Of course, every student needs a backpack to carry around all their books and folders. This is one area where I’m willing to invest, because a good backpack lasts for years and will protect the kids’ spines from the stress of carrying what seems like an ever-increasing load. Active Endeavors in downtown Iowa City has been a favorite go-to for quality backpacks that last. And finally, there’s all the stuff that goes into the backpack. Check your school’s website to see if the supply list for the upcoming year is posted. If not, some stores have copies of the lists available. In addition to Target and Walmart, check out office supply retailers like Office Depot and Staples for great deals on basics like notebooks, pens and pencils. My biggest tip? Start shopping early and avoid the rush. Then relax and enjoy the last lazy days of summer break, knowing your kids will be well dressed for that first day of school picture and well stocked for the year ahead.